Sprawling between upmarket Bel-Air and Brentwood, the 4-star Luxe Sunset Boulevard Hotel is a chic location for both wedding ceremonies and receptions, coupled with serene suites and rooms for both you and your wedding party. The hilltop location of this boutique hotel makes you feel like you’ve stepped into an urban oasis, while still being on the doorstep of all Los Angeles has to offer. You can get ready in one of their spacious conference rooms or opt for a bridal suite. Natural light pours in through the large windows and is ideal for capturing candid getting ready images and details shots of your bridal gown, shoes, jewelry and accessories. Their rooms feature mid-century style furnishings with all the modern touches, providing an elegant and non-intrusive backdrop to your wedding photography. Outdoor wedding ceremonies can be held in Luxe Sunset Boulevard Hotel’s charming courtyard, which is shaded by olive trees and elms. As you walk down the aisle you are greeted by its spectacular “fountain wall” that provides a soothing ambiance for you and your wedding guests. You can personalize the space with your own floral arrangements and decorations, and extend your ceremony with vows and rituals that are distinctly your own. 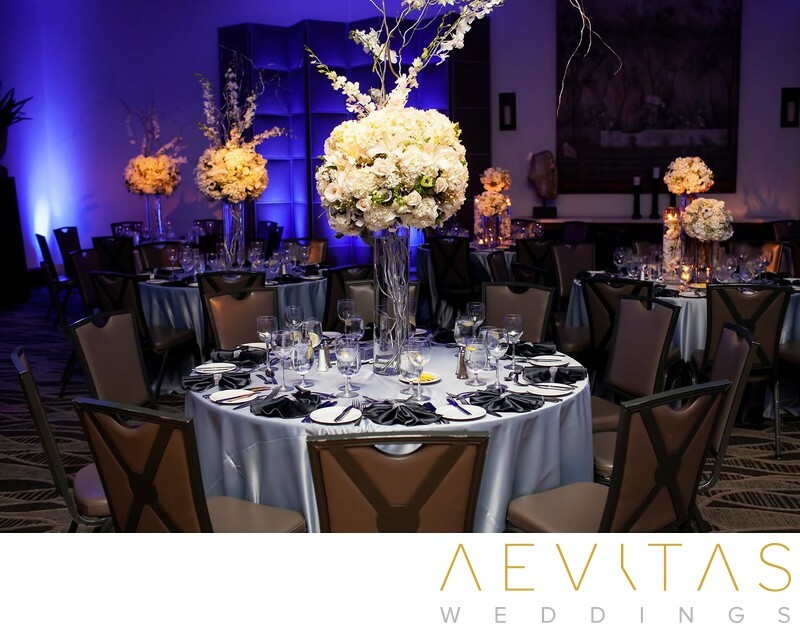 Wedding receptions are held in the adjacent Luxe Sunset Ballroom - a sophisticated space whose neutral colors can be transformed into any theme you like. Add uplighting and floral decorations to give the ballroom depth and color, and incorporate personalized details to make it a truly unique reception. Elegant chandeliers hang above and state-of-the-art audiovisual equipment is at your disposal, making it perfect for lavish, large-scale wedding receptions and multi-cultural celebrations with a 300 guest capacity. You can take advantage of the courtyard’s beautiful lighting during a nighttime couple portrait session, with numerous elegant spaces available around the hotel during the day to capture bridal party portraits and family formals. One of the Luxe Sunset Boulevard Hotel’s wedding planners will be on hand to assist you in planning your special day, including the choice of menu from their highly-skilled in-house team. With extensive knowledge of the venue and experience catering to large-scale events, you know that you are in good hands with this reputable hotel, renowned for fine cuisine and a flexible approach to wedding menus. Its location in West LA makes it ideal for not only local wedding guests, but also those coming from out of town. There are lots of tourist attractions and beaches easily accessible nearby, or they can just luxuriate in the services of the Luxe Sunset Boulevard Hotel’s spa. Whether you are planning an intimate celebration with just your closest family and friends or a large-scale reception, Luxe Sunset Boulevard Hotel offers a number of different all-inclusive wedding packages to create ease of planning and a stress-free wedding day.